Birding the Barnsley Moors with my dad on a flying visit back home over the weekend and we connected with returning migrants such as Pied Flycatcher and Redstart in Cliffe Wood, Langsett and staging Ring Ouzels (4+ - 1 male) and Wheatears near Hartcliff Folly. Both views to the east and west were stunning from Hartcliff, to the 'east' you could see the triple set of power stations along the M62 and the contours of the Yorkshire Wolds beyond, whilst to the west the moorland edge of the Pennines looked stunning in the Spring sunshine, as shown in the photo opposite (Midhope Res. 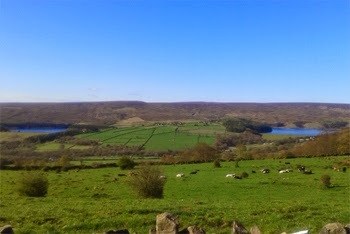 on the left and Langsett Res. on the right). A check of Ingbirchworth Res. produced no passage Terns, and nearby fields not yet? yielding Dotterel. Always worth a look at this time of year. Buzzards and Kestrels seen over the moorlands with a single Sparrowhawk, and 2 or 3 Ravens patrolled the uplands.